Basil is one of the irreplaceable herbs that will give each meal a very specific taste. Can you imagine making an Italian meal without the inclusion of the delicious herb? Most people use dried basil, since this way the herb can be stored over a longer period of time. However, the scent and taste of fresh basil are stronger and livelier. If you’re wondering how to store fresh basil, the following article is the right one for you. There are a few essentials to learn in order to extend the lifespan of the herb and enjoy its scent in your meals. Basil is a plant having rounded, green leaves. Nearly 60 types of basil exist and the taste and scent of each one is slightly different. Basil is grown throughout the world but it originated from India, Asia and Africa. It is used as a herb and provides the specific taste of Italian, Thai and Vietnamese cuisine, to name just a few. The name ‘basil’ stems from the Greek ‘basilikohn,’ which means royal. Greeks believed that basil was a sacred and very noble plant. 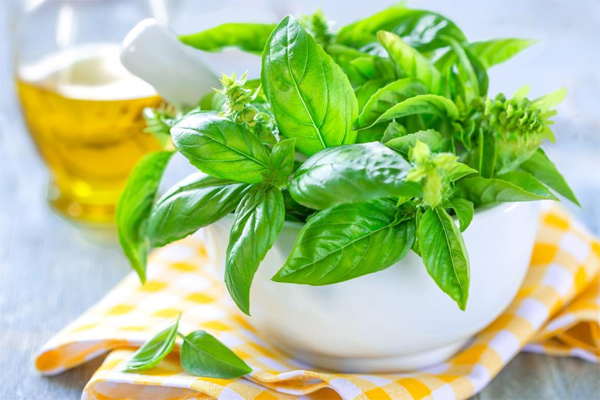 In India, basil was preserved as a sign of hospitality, while in Italy the herb was considered a symbol of love. How to Store Fresh Basil? When you have a choice, go for fresh basil. Fresh basil has a much better taste than the dried variety. Here’s how to store fresh basil for a longer period of time. The first essential is to buy good, high quality basil that’s just been picked. To recognize good basil, you need to examine the leaves. They have to look fresh and deep green. Avoid basil leaves that have dark spots or yellowish color. Keep fresh basil in the refrigerator. Place the herb in a slightly damp towel, in order to provide it with moisture. This way you will be able to prolong the life of the herb over a period of one week. Freezing fresh basil is not the best option, since the taste of the herb changes as a result of the process. You should remember to add fresh basil towards the end of the cooking process. Its essential oils are highly volatile and if you add basil too early, you risk diminishing significantly its taste. One old storage technique is very effective and can be used to prolong the life of fresh basil. Chop the herb or use the entire leaves. Wash them and let the leaves dry. Put basil in an appropriate container that can be sealed. Pour olive oil over the herb and close tightly. This way you can store fresh basil over much longer periods of time. Another very simple and useful idea is to plant basil in a pot. Having the herb growing at your home will provide you with a constant supply of fresh basil. Potted basil requires no specific care. It will need quality soil, sufficient amount of sunlight and water. Growing basil at home will keep its taste unchanged. The best part is that you can pick the leaves from your plant and use them immediately to prepare tasty and aromatic meals.